Poetry Teatime—a simple idea with big implications. For as long as I can remember, adults and kids routinely confess a fear of poetry. They say, “Oh I hate poetry. It’s too difficult to understand.” In truth, most people assume they must do something with poetry—analyze it, make meaning from it, find its themes and imagery, identify its rhyme schemes. The provocative rhythms and sometimes old world vocabulary act as barriers to enjoyment, too, for so many smart, successful, fluent, English-speaking adults! Yet somehow I managed to develop a love of poetry from an early age. My grandfather gave me a book of poems to read aloud when I was seven years old. I still have it. I played with words and wrote my own poems on scratch paper and in my diary. Poetry felt like puzzles, riddles, inside jokes, and bursts of music to me. I didn’t worry too much about “getting” it. Enter teatime. In most parts of the world, afternoons are incomplete without a hot drink break. There’s a universal urge to pause, to rest, to draw in to self and community around a soothing beverage. As a tea drinker myself, I looked forward to my afternoon mug of the strong stuff. The experience left such a good taste in our mouths, I realized that I could use the same strategy to introduce poetry! I stocked the table with Shel Silverstein and Jack Prelutsky—knowing that poems with punch lines would be a good introduction. We laid the table with tea cups and mugs, honey, a pitcher of milk, home made scones, raspberry jam, and candles. I passed out the books and each child chose a poem to read. I read for the non-readers. We laughed. We paused. We repeated silly rhymes. We sighed. We resumed the rest of the day less frantically. The joy and natural ease around that table assured me that learning, in all its fullness, had occurred. Since the first teatime in 1997, thousands of families have adopted the same practice. 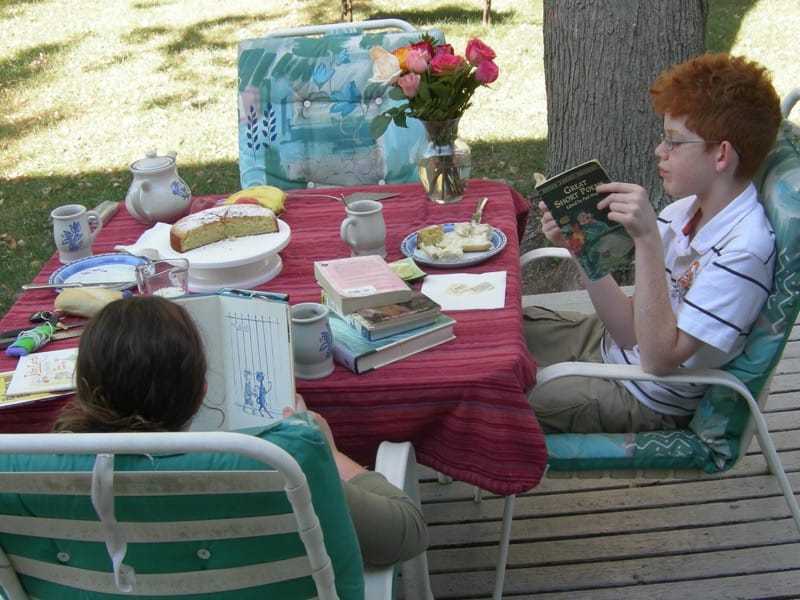 They are discovering that old, young, male, female, schooled, homeschooled, unschooled, in college, around the world—all find poetry delightful when enjoyed in the setting of teatime. Poetry appreciation (enjoyment) leads to so many good places—greater awareness of the power of language, the apt word, linguistic musicality, the impact of a metaphor, and the joy of creativity. Teatime leads to restored equilibrium in a busy household, delight for all the senses, nourishment, and family bonding. There are few practices parents can adopt with their children that have as much power to transform the family dynamic with so little effort as this one ritual. This website is our gift to you—a support to enrich your poetry teatimes so that they are as magical and warm as the tea you sip from your cup and the poems you pop past your tongue.